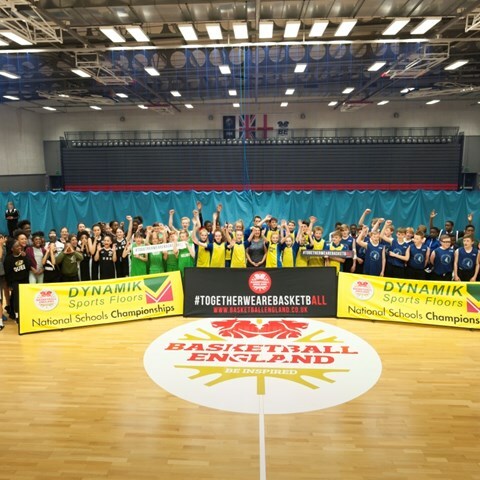 Many great memories were made at the DYNAMIK Schools Basketball Championships 2018 with teams experiencing the best in basketball facilities at the National Performance Basketball Centre in Manchester. Friday saw the energy build with schools across the country taking part in the U12s Celebration Day through to a full weekend of the DYNAMIK National Basketball Finals. DYNAMIK installed the purpose built sprung flooring at Belle Vue Sports Village which is home to Basketball England, the National Governing Body for Basketball in England. As their Official Sports Flooring Partner, DYNAMIK has contributed to grass roots sport in terms of gifting sports equipment to local schools and basketball clubs as well as being headline sponsors of the National Schools Basketball Championships, donating winners t-shirts, medals and plaques. You can view more of the action on the Basketball England website featuring all the teams that made it to the Finals. Coaches and teams were delighted to have played on a sports floor where professional athletes train and winners are made. Dan Hildreth, Head Coach at Holy Trinity School in Sussex. Hannah Wallace, Head Coach at Bristol Metropolitan Academy. DYNAMIK excel in providing the best solutions and provide free of charge quotations and school surveys which are carried out if a school is looking to upgrade or maintain their sports flooring. Contact us for more information on how we can help you.